No food or drinks other than water inside the studios. No exceptions! No cell phones are allowed in the dance rooms at any time. If they are inside a dance bag, they should be turned off. MDW is a large place, so please keep an eye on your children, no running or climbing on furniture PLEASE! All personal belongings may be kept in the dressing room or in the hallway cubbies . Montana Dance Works is not responsible for items left behind at Montana Dance Works. Please make sure you check for all your belongings before leaving the studio. Please leave ALL valuables at home including cell phones, fit bits, smart watches, jewelry, etc. Please check the bins in the changing room for lost items. All unclaimed items are donated to charity monthly. Please make an effort to be prompt! Excessive tardiness picking up your child will result in additional fees. No parents, friends, or siblings are allowed in the classroom at any time. This is for the benefit of your dancer. They will learn more if we have their complete attention. If your dancer drops a class, a 30-day written notice via email is required. You will be responsible for payment until the written notice is received. For the safety of our dancers, we follow Butte Silver Bow County's decisions on inclement weather school closings. However, you should always use your own judgement when deciding to travel due to weather. We will confirm our closing via email when inclement weather affects Montana Dance Works. We will also communicate all schedule changes on social media as well! All classes missed due to inclement weather can be made up at your convenience using our existing class schedule. Our front desk is available during class hours to answer any questions you might have! If you need to speak with your child’s teacher, please call or email to set up an appointment as we rarely have time in-between classes. You can reach us at info@montanadanceworks.com or 406.299.2381. Please only use the drive thru lanes for pick up/drop off only. Please do not park in the lanes as it creates a traffic jam behind you. If necessary, please loop around until your child is ready at the door. Also, please help us be good neighbors by avoiding using the parking lot of the adjacent businesses. Street parking on Discovery Drive is available for overflow parking. We appreciate your cooperation! Student Account Portal: Each family will have a student account portal to process payments, register for classes, etc. It is your responsibility to keep all info (contact info, payment info, etc.) up to date. You can sign up or log in on the home page of our website. Please contact info@montanadanceworks.com with any questions about your portal and/or account info. Communication: Communication with our families is so important to us! We send monthly statements and announcements by email and these are posted on our website as well. 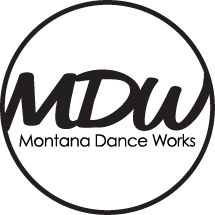 Please add “info@montanadanceworks.com” as a contact in your email and let us know if you are not receiving updates. We also post updates to our website frequently, and we’d love to have you “like” us on Facebook to hear the latest chat on what’s going on at the studio. Montana Dance Works tuition is based on an entire season of dance. Our season runs from September 11, 2019 - May 22, 2020. All dancers are required to pay for the entire season. Tuition is not based on the number of classes in a month or attendance. There is NO refund for missed classes. You may pay the entire season in full or divide it up into 9 monthly installments. The first installment is due with your registration fee, and this installment is non-refundable. The other installments are due the 1st of each month, September 2019 - May 2020. Tuition is due on or before the 1st of every month regardless of what day of the week, holidays, etc. You may pay online through your student account using a credit card or checking account, at the front desk during class times, or using our locked mailbox to the left of the front doors. Recital costume payments are due on or before November 1, 2019. If you pay the entire season in full prior to September 30, 2019, you will receive a 5% discount. Please note: If you pay your dancer’s tuition for the full year and withdraw from classes for any reason (loss of interest, school obligations, injury, illness, etc. ), a 30% penalty will be applied to your refund for the remainder of the year. We suggest you only pay the year in full if you are 100% confident your dancer will participate fully in the entire season. Late Fee: A $10 late fee is applied to your account if payment is not received ON OR BEFORE the 1st. If you are on Auto Pay and your card on file is declined, an alternate payment must be made within 48 hours. We accept cash, check, MC, VISA, DISCOVER, and AMEX. If your student must withdraw from a class, please do so in writing via email to info@montanadanceworks.com. You are responsible for your student’s monthly tuition until withdrawal notice has been received by the administrative office. Please note that the tuition balance is due and payable upon withdrawal. We produce three fabulous productions at the end of the year with all MDW dancers. The 2020 recital week (including dress rehearsals) will be May 17-21. This is an exciting and rewarding part of the season that everyone looks forward to! Stay tuned for 2020 Recital details to be released throughout the year. PLEASE NOTE: Dress rehearsals are mandatory in order to participate in the recitals. This is for the safety of your child and the other children on the stage. Please plan accordingly! RECITAL COSTUMES: Costume costs are $60 for our students Grades 3rd and under and $70 for students Grades 4th and Up per costume. Costume fees will be due on November 1, 2019. After this fee is processed on November 1, it is non-refundable. Any costume alterations needed will be the responsibility of the parent. We welcome payments in full before the due date, or installments. We cannot guarantee that costumes will arrive in time for the recital if payment is not received by the due date. Costumes will not be handed out to students with a balance due. Costume fees are NON-REFUNDABLE. If your dancer will not be participating, you are required to notify us by email to info@montanadanceworks.com no later than November 1, 2019. Please do not rely on your dancer to inform us that she or he will not be dancing in the recital! RECITAL TICKETS: Tickets to our recitals will need to be purchased. Dancers performing in the show do not need a ticket. More information on Recital Tickets, including when they will be available to purchase, will be included in the 2020 Recital Packet packet released in April. ​Please make sure your dancer is set up for a great class experience by providing them with the appropriate attire and shoes. You can find a dress code description and shoe requirements on our website under dress code. Jeans ans jewelry Shoes can be ordered and fitted at the front desk. MDW also carries dance attire, leotards, shorts, skirts and tights. 2019-2020 CALENDAR: We generally follow the Butte School District Academic Calendar for closing. Dates subject to change based on the school calendar release. Please see full calendar for details.